I know it's Thursday and I usually don't post on Thursday but I HAD to show you these polishes. 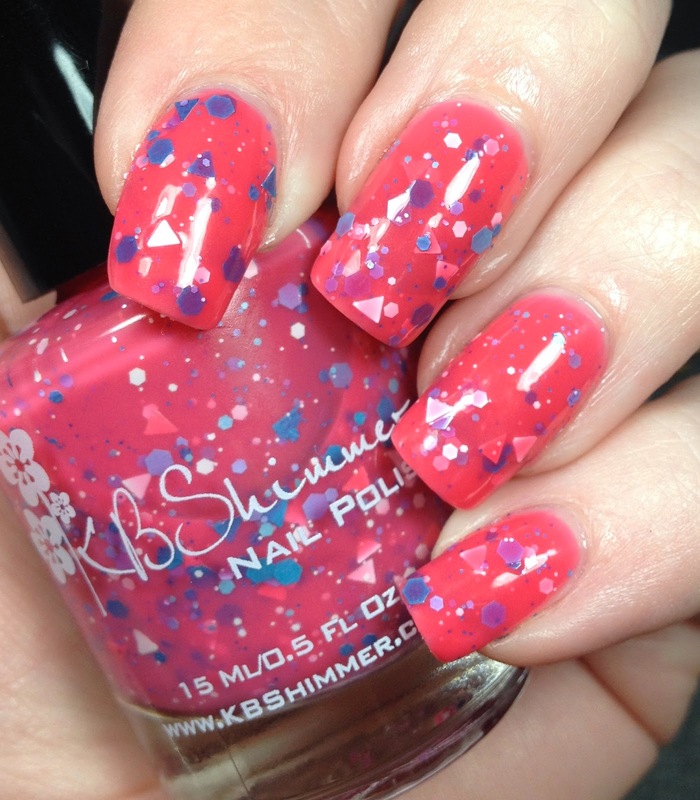 In case you didn't know it, KBShimmer has another summer collection that is coming out tomorrow. it is 12 polishes and they are awesome. There are 9 glitter polishes, a holo and two creme polishes. I was a lucky lucky girl and got six of the twelve ahead of time to try out and show you. I am so in love with all of them. Every single one of them was great. I was also sent some nail vinyls to work with. I have never used those before so look for those in an upcoming post because I need to get the hang of them first. Let's just say that my first attempt didn't look so good. So let's get into the polishes! 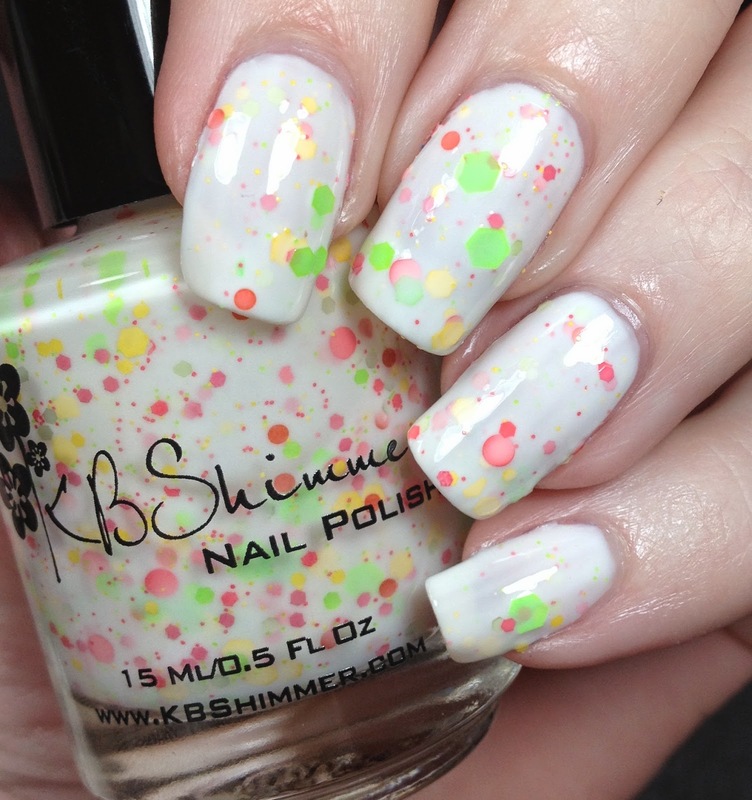 I used all the descriptions that are provided by KBShimmer. First up is Peak My Interest. 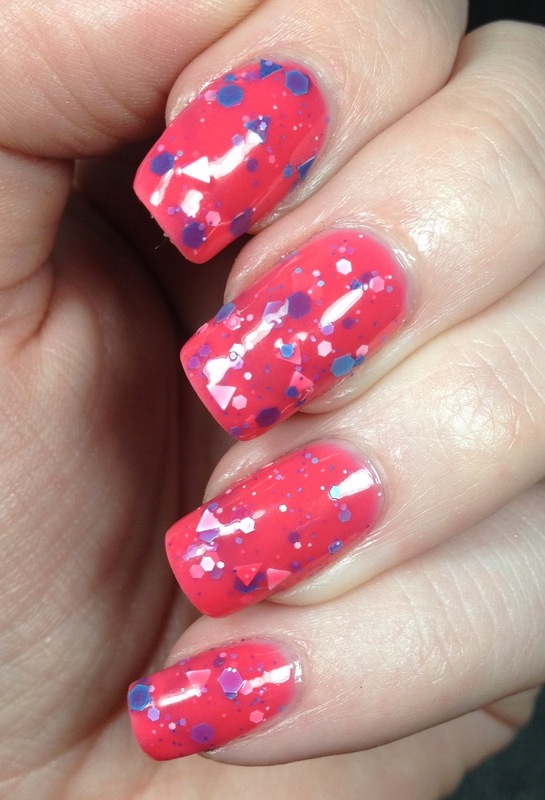 They describe this as "a melon pink colored polish with triangle glitters in white, pink and dark aqua. I have shown three thin coats topped with Rica's Glossy Glam. No issues with the formula. 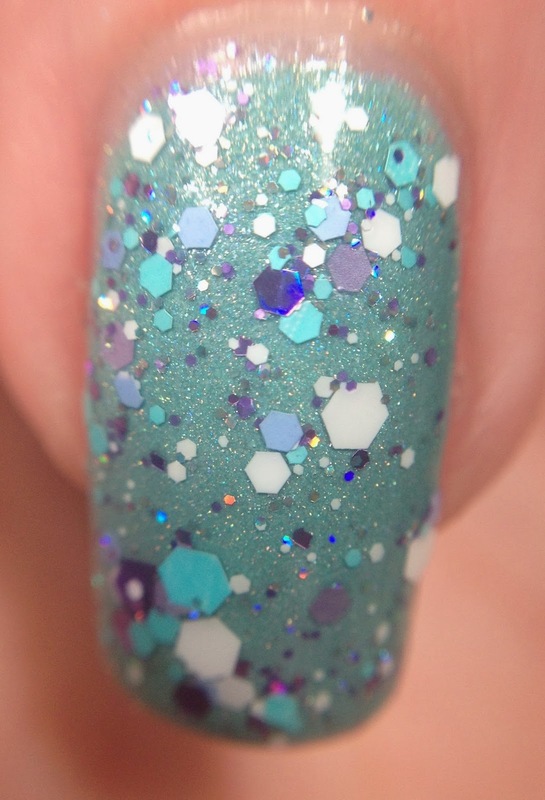 This was my first ever polish with triangle glitters and now I want more!!! Next is Mixed Peelings! (What a cute name!). This one is so different for me, which is why I picked it out. 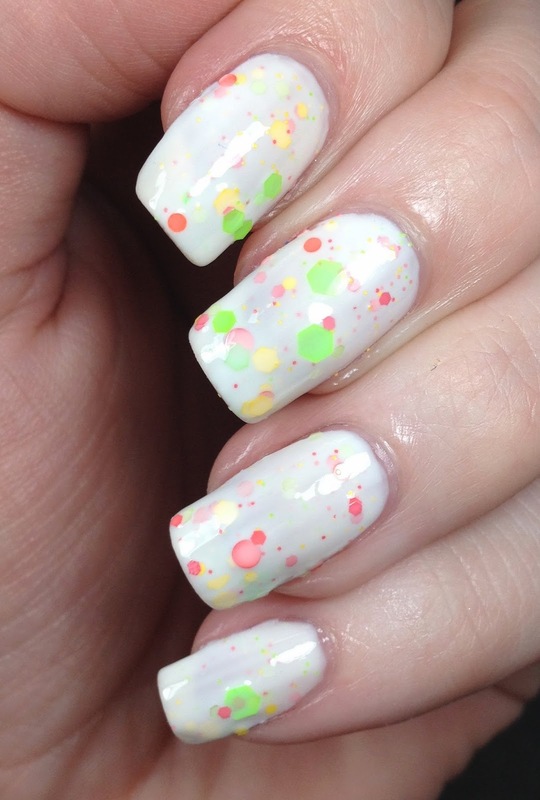 They describe this as " a creamy off white polish with citrus and fruit colored glitters in neon green, lemon yellow and watermelon pink". 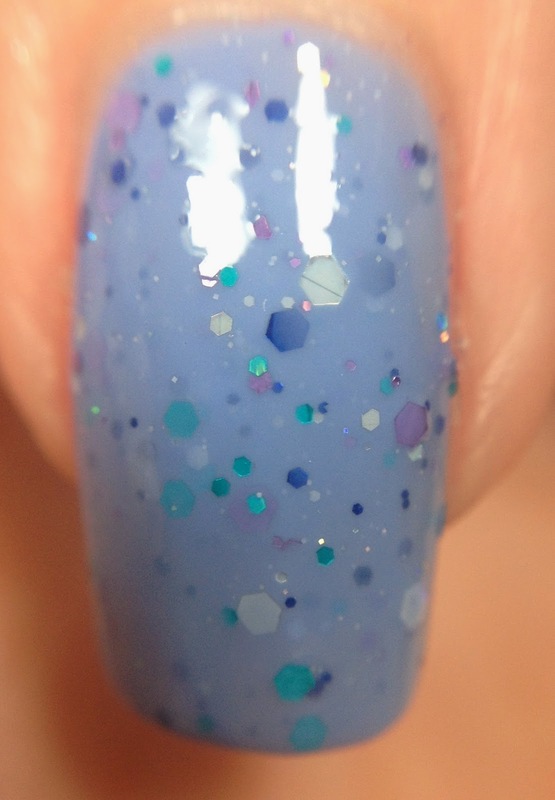 This one was also three thin coats and topped with Glossy Glam from Rica. Ahhhh....the holo of the bunch. 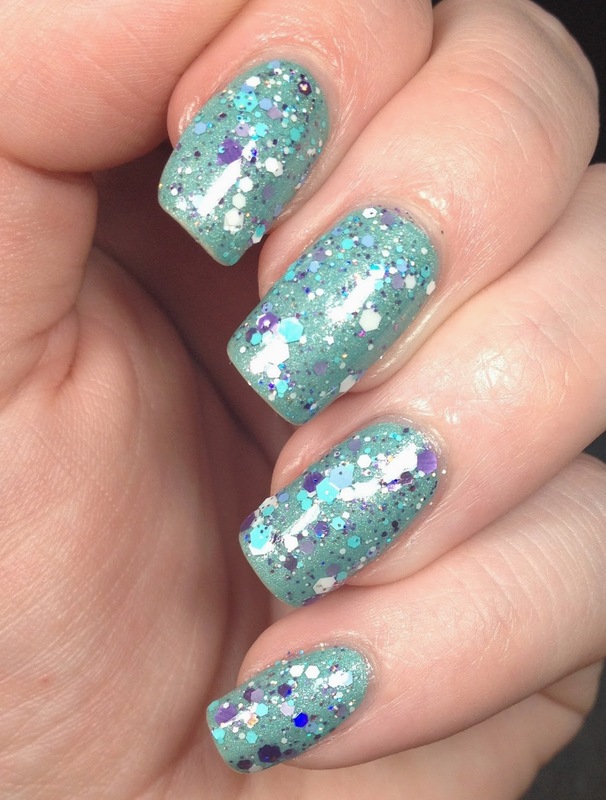 (I love holos) This is Mint-al Vacation. 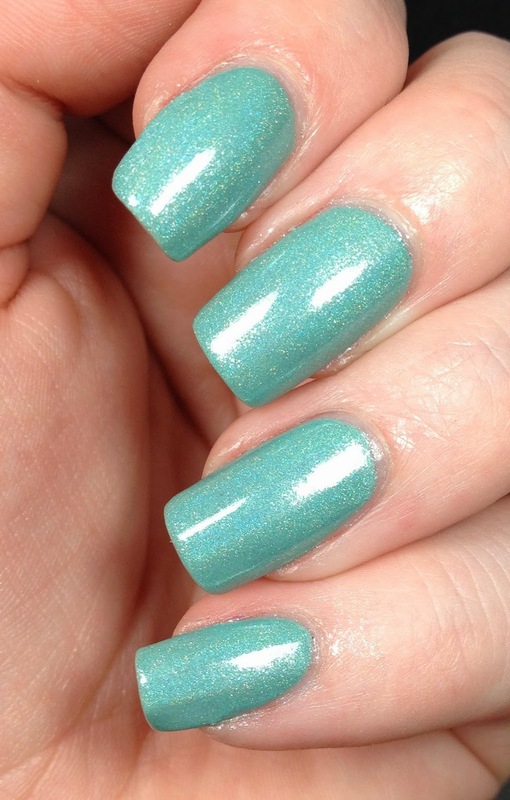 The name pretty much says it all, it is a beautiful mint green holographic polish. I used three thin coats for this and topped it with Glisten and Glow HK Girl. I took that same polish and then topped it with another new glitter. This mix is called Happily Ever Aster. 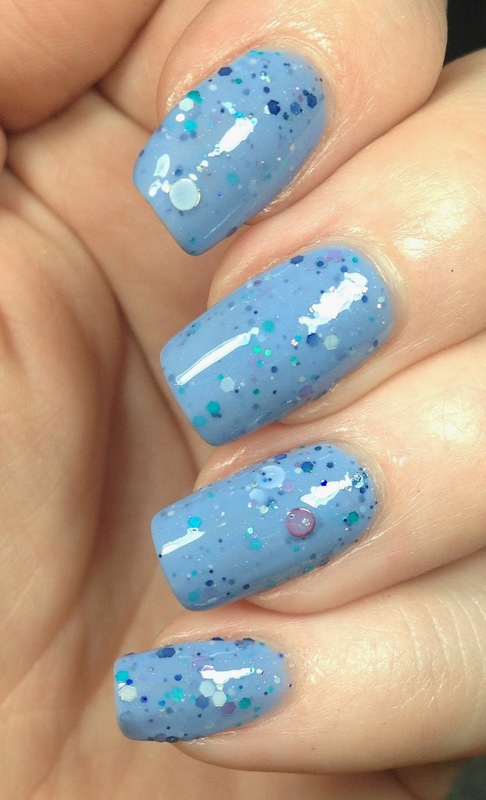 This is described as " a floral inspired glitter topcoat with purple, lavender, light aqua and white glitter swimming in a sparkling base". Oh this glitter made me swoon. The color mix is amazing. I thought it paired well with Mint-al Vacation. 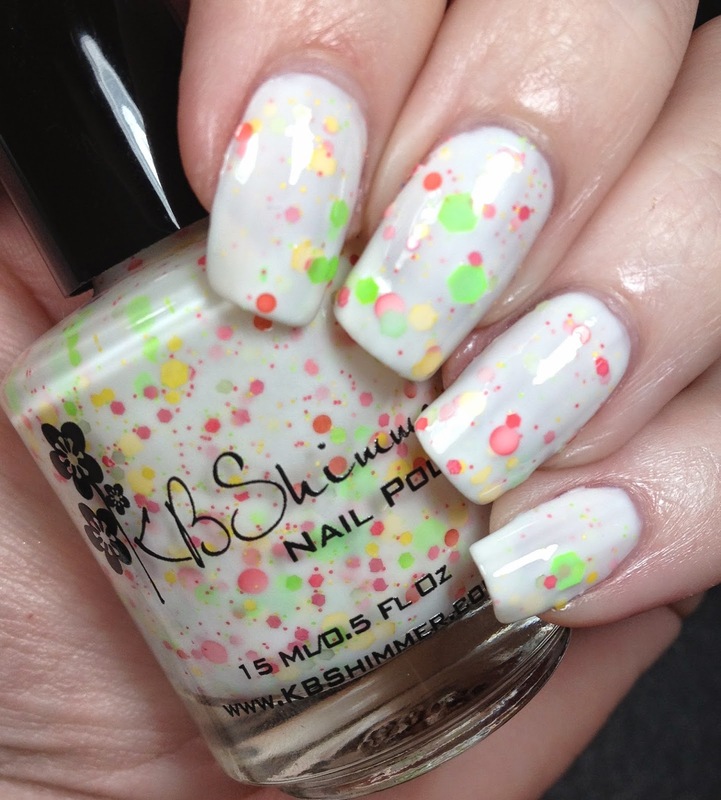 I used two coats and then I topped it with Clearly On Top topcoat from KBShimmer. No digging for glitter in this one! This is Periwinkle In Time. One of my favorites (but really I can't pick favorites they are all beautiful!) 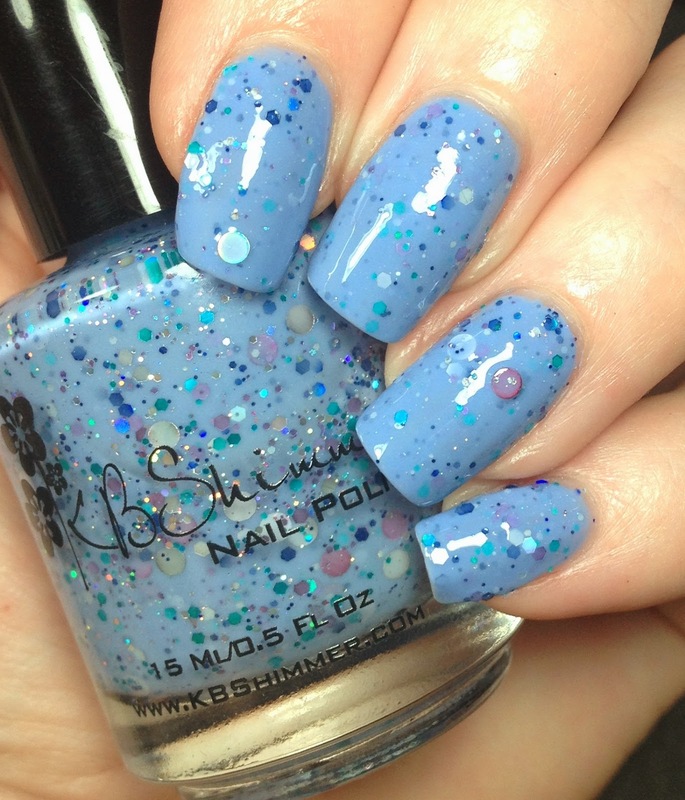 This is "a periwinkle colored crelly polish loaded with holographic glitters in aqua, navy blue, silver and violet. Y'all know how I feel about purples. So this one was an immediate hit for me. For some reason I didn't write down how many coats this was, so I am going to say three. 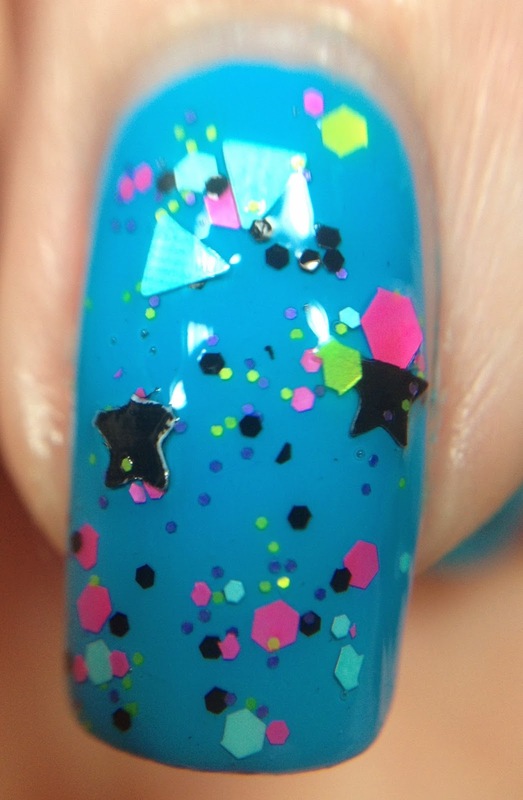 I also have it topped with Clearly On Top from KBShimmer. Last, but certainly not least is Scribble Me This. 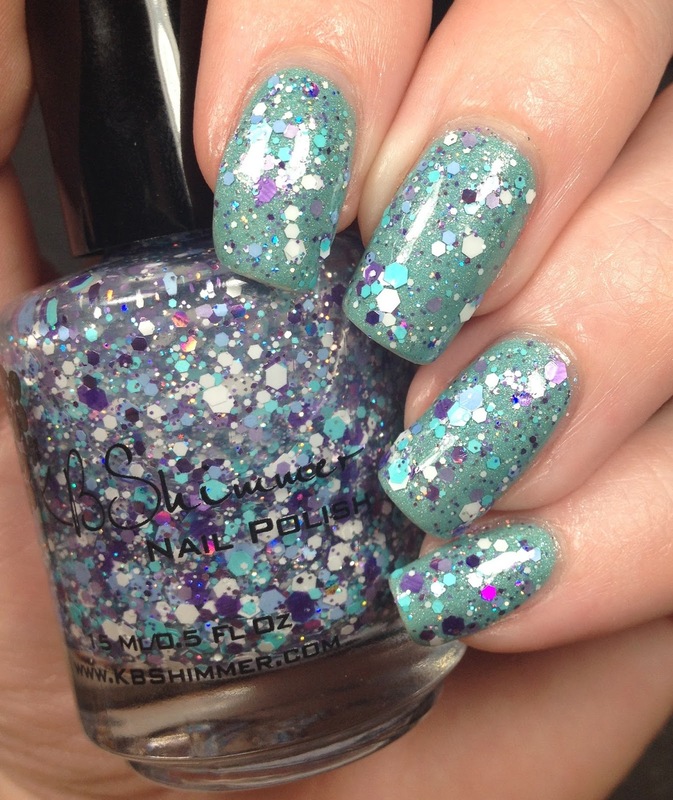 This is an AMAZING glitter topper. Those shapes in there really make this unique. 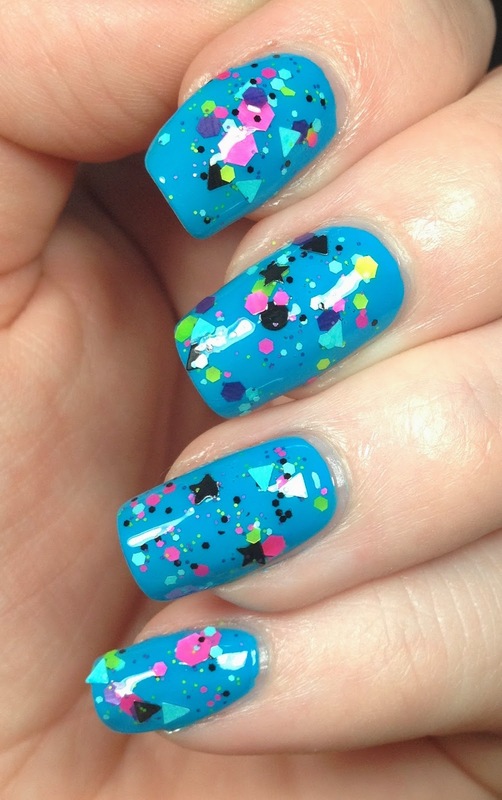 It is "a graffiti inspired topcoat featuring mini stars, triangles and neon glitters. I did two coats of Scribble Me This over Sinful Colors Jolt. It is packed with glitter so there is minimal fuss over getting it out of the bottle. I also topped this with Clearly On Top from KBShimmer. This was such an amazing (to me) combo. Love it so much! That's it! 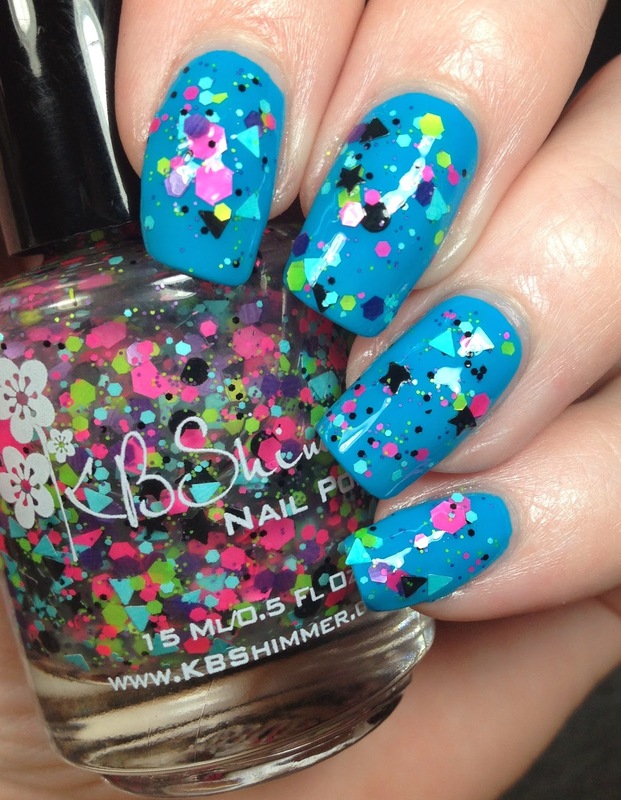 That's my six polishes from the summer collection from KB Shimmer. It will be available starting June 20th! May sure you run right over and snag anything you see that catches your eye! Any of them catch your eye? Would love to hear what you planning on buying! I will say that even if these weren't provided to me, I would still buy them. I have purchased from them in the past and will continue to do so. My recent order of the base coat and top coat arrived super fast! Those are all so nice. I love each one of them.